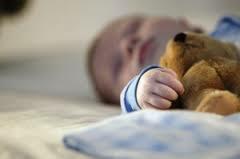 No matter the age of your baby you have probably encountered a short nap or two in your day. How many times have you laid your baby down hoping for a nice long nap so you can get something done or God forbid, take a nap yourself… only to find her waking up 30-45 minutes later just as you were drifting off into your own dreamland? Actually, a 30-45 minute nap makes a lot of sense when you learn that the typical sleep cycle for a baby is 30-45 minutes; compared to about 90 minutes for adults. If your baby has not yet learned how to put themselves to sleep without any help from you, when they wake up after their first sleep cycle ends, they don’t quite know what to do to get back to sleep. Help your baby fall asleep in the same location where they will wake up. Can you imagine falling asleep on the couch only to find yourself in your bed when you wake up? If it were me, I can easily imagine feeling a tad confused as to how I got there. Oh and also imagine that you were snuggled up in a nice warm blanket on the couch only to find nothing covering you in your bed! So now you are confused AND mad that your original comfort was taken away without you knowing! This is how your baby feels if they fall asleep in your arms or on your chest and then you pull the switcharoo and sneak them into their crib after they are asleep. So how do you do this? Help your baby figure out their own way to go to sleep so they can do it again when you aren’t there. If you do most of the work for them they will have no choice but to call for you when they wake because they need that help again to get back to sleep. If your baby is younger, go ahead and give them some comfort but let them do most of the work themselves. Help them over the “hump”. If they do wake around 30-45 minutes and are calling for you, know in your mind that they are probably not ready to be awake yet as this is not a restorative nap. You can go to them and gently try to coax them back to sleep to help them get over that “hump” from one sleep cycle to the next. Eventually they will be able to do this on their own. For any age baby, a nap that lasts less than 60 minutes is not enough to help them restore their energy for the next wake time so make it your goal to get at least one hour for each nap of the day. Happy Napping! If you have specific tips that have helped your baby nap better and longer, please share them below! And if you need help with improving naps (or any sleep for your baby), set up a Let’s Get Acquainted session with me and let’s chat!